In just a few short years, Laird Barron has become something of a superstar in horror fiction, especially horror in the tradition of H. P. Lovecraft. In my last post, I reviewed The Croning, Barron’s keenly awaited debut novel after the success of his award winning short story collections The Imago Sequence and Occultation. And many horror fans are waiting (still!) for the release of his new collection, The Beautiful Thing That Awaits Us All — an unfortunate victim set back by the fallout from Nightshade Books. But one of Barron’s works that I’m not sure many know about is his 2011 novella, The Light is the Darkness, from Infernal House. 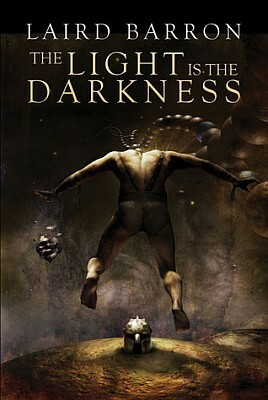 The background premise of The Light is the Darkness might be a bit hard to swallow as part of our own world, at least to the extent portrayed by Barron; but we are presented with a contemporary world where an underground, and presumably illegal, sport of modern and bloody gladiatorial games takes place. These games seemingly extend worldwide and are only attended by the super-wealthy elite. Conrad, the main character, is an up-and-coming star in these games. But, apart from one “unsanctioned match,” we actually see very little of the gladiatorial violence until the very end. The games seem to mainly operate as backdrop to explain how Conrad has the leisure time and funds to undertake an investigation of his missing sister Imogene. In addition, the gladiatorial games seem to attract all manner of seedy and questionable characters, explaining why Conrad must deal with them. In summary, The Light is the Darkness focuses upon Conrad’s search for Imogene, which unravels not only riddles concerning what his sister was up to before her disappearance, but also various secrets related to the rest of their eccentric but deceased family. There are various levels of intrigue and mystery involved throughout. However, in good Lovecraftian fashion, Conrad’s discoveries mount with menace laced with macabre. As Conrad proceeds to find out, it seems that Imogene and the rest of their departed family were up to some bizarre and dubious dealings. Barron does a great job here of mixing super-science with occult musings, making the distinction between science and the supernatural seem like a plausible and seamless continuum. In addition, Conrad’s search also is mixed with his journey of becoming something “other,” though it’s not quite clear what. Is he slowly transforming into a super-hero or a god? This process, and its outcome, was never quite clear to me and perhaps Barron purposely makes this facet of the story ambiguous. 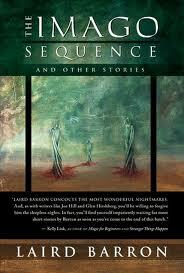 But, as with most horror stories, one cannot say that this book has an altogether happy ending. Conrad’s search, and transformation, meets some success, but with markedly mixed results. Sounds like a scene from James Cain or Lawrence Block story, or maybe even a Quentin Tarantino movie. I don’t like that mean old uncle of yours. He’s a fraud. Not as sick as he lets on, that’s for damn sure. [. . .] We were here for Christmas. After everyone went to bed, the old man rolled out on the balcony in his creepy throne-mobile. I was down here in the bushes smoking a joint. He stepped off the balcony and zipped into darkness like one of those wire-fu action heroes. I didn’t see where he went. Heard him cackling though. WTF? Was the woman just high as a kite or is Uncle Cyrano something more than he seems? Barron does more than just give little tidbits like this throughout. There is a satisfying payoff after the horrific mounts to its zenith. I highly recommend Laird Barron’s The Light is the Darkness as not only a good horror story, but also as a good example of noir fiction.